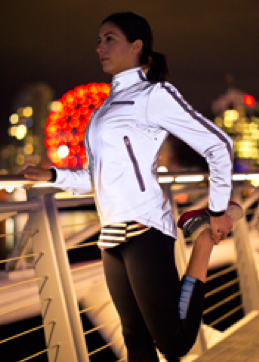 The Lululemon Blog posted a glimpse of the new running jacket due out this week called the Run: Reflective Jacket. This jacket was featured in a magazine ad back in December and was quoted as being priced at $300. I suspect lululemon will have revised that price considering how poorly their inflated prices did over Christmas, causing them to reprise several items before finally going to markdown. A 360* running jacket is definitely very useful for night runners, but that is a lot to invest in a jacket that may not have the temperature versatility you need for that price.